The specialty of Lucky Dog Hot BBQ Sauces is the unique flavor which comes from tones of roasted peppers. These fiery flavorful sauces have won awards at various national and international competitions. There are a total number of 11 sauces produced by Lucky Dog Hot Sauce. These sauces offer a varied range of flavors and levels of heat. 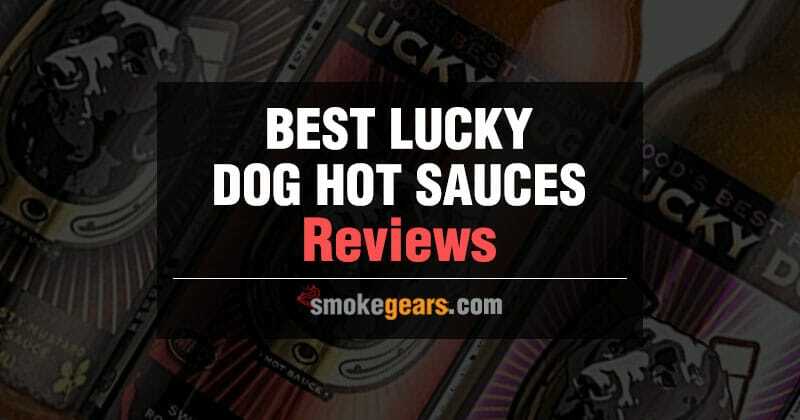 In this section, I have reviewed three of my favorite Lucky Dog sauces, which I use very often, especially, if my friends come over for cozy get together. I serve the snacks with these sauces. According to the manufacturer, this is a “ridiculously tasty” sauce. This sauce brings a unique balance of mustard, and chipotle. This is a thick sauce with great texture. Main ingredients of this sauce are - mustard powder, roasted garlic, water, cider vinegar, onion, and chilies (jalapeno, dried chipotle and dried scotch bonnet). Presence of pears and figs, along with lime juice concentrate bring sweetness in the sauce. It tastes great on steak, chicken, and pork. You can also try it with tuna sashimi, and sourdough bread. On the other hand, you can also use the hot sauce as a taco sauce while it tastes great on ham and with eggs. Adding this sauce on pizza or burgers only enhances the taste of those dishes. Lucky Dog Mustard Chipotle Hot Sauce is available in 8.5 Fl Oz Bottle. This is a sauce for those who love medium hear but strong flavor of the pepper. You can use this sauce pretty much on everything including rice. Any Mexican style food will become more delicious with a little bit touch of this amazing sauce. It enhances the flavor of your food, doesn’t overpower it. An amazing feature of this red label sauce is-it contains carrots which are a unique ingredient for any hot sauce. It is known as an “extremely versatile sauce” to most of the users. This Fire-roasted Pepper Sauce complements various cuisines such as India, Middle Eastern, Italian, and many more. It comes in an 8.5 Fl Oz bottle. Highlighted Features: Another award-winning sauce by Lucky Dog Hot, contains a great balanced blend of Habanero, Jalapeño, and Serrano peppers. You know why is this sauce different from others? Because this is the opening and only non-pepper blend sauce from Lucky Dog Hot. This light smoked mild sauce is made with jalapeño chilies which add a tangy flavor to the sauce. To add sweetness in the mix, Californian figs and organic apples have been used in the paste. It goes well with any kind of meat including beef, pork, chicken, and vegetables. A lot of people also use this sauce in pizza dough, sandwiches, and other snacks. For the sweet and mild spice flavor, you can serve it with curry based dishes as well. It doesn’t contain any cane sugar, 100% fruit sweetened. Highlighted Features: Non-pepper and fruit-based sauce. You are very lucky if you have one of these fiery sauces in the pantry. Because you can try these sauces pretty much with everything. Like I already mentioned above that I use these sauces with snacks. They are a great combination of snacks like pizza rolls, fried chicken, potato wedges, tacos, and nachos. Additionally, you can use the sauce as a dip with any kind of potato chips. I often use the sauces as a salad dressing too. If you love heat in your dishes, preferably curry items, Lucky Dog sauces are great to use as a marinade along with other ingredients. Over the years, Lucky Dog has made its place in the shelves of both local store and supermarkets. You can find these sauces anywhere or order it online. They come in a nice size and shaped bottle. These bottles are user-friendly and easy to open for little zip strip. Give these amazing sauces a try, I am sure you are going love the taste and flavor very much.